against the federation of Pakistan. British on 11th August 1947. The Khan of Kalat (KoK) rejected the idea of joining Pakistan. of Kallat state with Pakistan. provide employment to the Baloch. of the US-led India and Israel against Pakistan, China, Russia and Iran. maintain their status, prestige and influence at the cost of people of the province. youth are very loyal and patriotic Pakistanis who believe in unity and sovereignty of the country. terms like Hindu militants and Jewish terrorism or Christian militants. Islamic State group (Daesh, ISIS, ISIL). They got the label of terrorists. Europe and other Western countries. 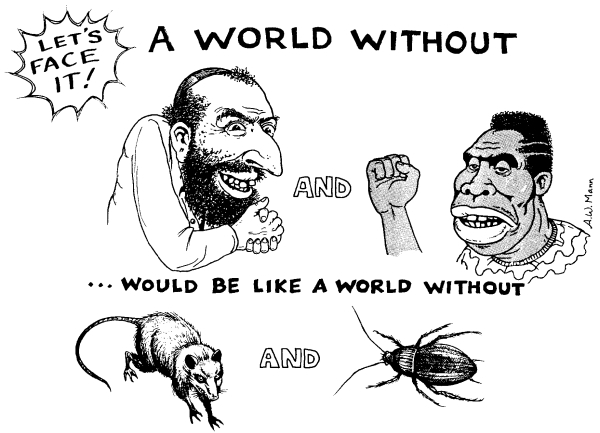 scholars have estimated the genocide of the 7.8 million Jews. industry, they have converted the world into corporate industry. its sudden terms of globalization such as free markets, privatization and de-nationalization etc. Kosovo—genocide of the Bosnian Muslims annoyed the Muslims all over the world. World—radicalizing the Western Christians against the Muslims. world owing to the US assistance. countries, including NATO states which also joined the fake global war on terror. which still continue became the part of the American CIA, Israeli Mossad and Indian RAW. Iraqi prisoner at close range in a mosque in Fallujah where civilians had taken shelter. Pakistan and especially in Iraq. etc. where torture was conducted directly by American intelligence operatives. millions were displaced as a result of the chaos and brutal practices. people including civilians died in Afghanistan and Iraq. Yemen etc. in general and Pakistan in particular, he converted Egypt, Libya, Syria, Yemen etc. medical treatment and starvation has displayed the holocaust on larger scale. targeted killings to maintain alien rule on these territories. June 28, 2012, while more than 20,0000 are missing. the CIA-Mossad- assisted ISIS terrorists, Al-Qaeda’s Al-Nusra Front and the rebel groups. against the Muslims and the international community. RAW and those of the vulnerable CIA operatives. openly against the Muslims and Syrian refugees. and these countries might be cited as instance. religious lines with the negative projection of Islam. especially in the ISIS group, inspiring the extremist Muslims for more terrorism-related attacks. worlds or to cause a nuclear war between Russia and the US-led some Western countries. religious lines which would convert the whole world into holocaust. President Trump’s policy in the Greater Middle East is beginning to materialise. While up until now, the United States and their allies have been attempting to destroy states and impose chaos, they are now legitimising alliances against the jihadists. Although in theory, Iran, Syria and the Hezbollah are still enemies to be defeated, in practice, they have become partners. In the end, this new deal could enable the states of the region to force the multinational companies out of the political sphere and re-establish peace. From right to left (method for reading images in the Arab language) – President Bachar el-Assad (Syrian Arab Republic) General Secretary Sayyed Hassan Nasrallah (Hezbollah), General Mohammed Ali Jafari (commander in Chief of the Guardians of the Revolution), President Michel Aoun (Lebanese Republic of Lebanon), Prime Minister Haïder al-Abadi (Republic of Iraq). Brothers in arms against the jihadists. Little by little, President Trump’s foreign policy is taking shape. Concerning the Greater Middle East, he has managed, with the help of his National Security advisor, General H.R. McMaster and his Director of the CIA, Mike Pompeo, to put an end to to the secret programmes which offer help to the jihadists. Contrary to the innuendos published by the Washington Post, while this decision was taken just before the Trump-Putin meeting at the G20, it had in fact been taken a little more than two weeks earlier, during the preparation of the mid-May summit in Riyadh. Its objective was not to kneel before the Tsar of Russia, as the Washingtonian political class purport, but to put an end to the use of terrorism, as Donald Trump had declared during his electoral campaign. The lying insinuations of the Washington Post were adopted by the whole of the Western Press. Perhaps this is due to the gregarious spirit of Western journalists, but perhaps – more probably – it demonstrates that the major medias are owned by the partisans of war in the Middle East and against Russia. The Bulgarian revelations about the existence of a vast arms trafic set up by General David Petraeus when he was still Director of the CIA, in 2012, and continued by him from his offices at the financial investment fund KKR, leave one stunned at the power of these war-makers. 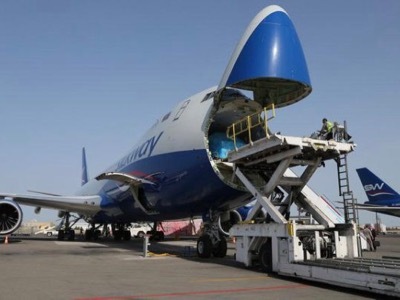 At least 17 states participated in operation « Timber Sycamore », in which Azerbaïdjan took care of the transport of 28,000 tonnes of weapons and Israël supplied false documents concerning their final destination. In all likelihood, David Petraeus and KKR were helped by the Assistant Secretary General of the UNO, Jeffrey Feltman. Of course, this gigantic traffic, without precedent in History in terms of its volume, will lead to no legal action, neither in the states concerned, nor on the international stage. Clearly, for the last four years, the People of the Levant have been fighting not only against states, but above all against a consortium of private multinational companies, including the international media and mid-range state powers who give their orders to small states charged with doing the dirty work. In any case, the difficulties encountered by Donald Trump in imposing his will on the CIA and the Pentagon, as well as the existence of this parallel half-public, half-private network, enable us to note the complexity of his task in a world order subverted by private interests. So far, the offensive by the Iraqi and Syrian armies aimed at re-opening the Silk Road have not been stopped by the US forces, despite various incidents. The offensive launched in the Jurd d’Ersal by the Syrian Arab Army, with Hezbollah and in coordination with the Lebanese Army, is the first visible fruit of Washington’s new policy. 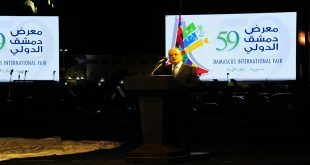 While harshly criticising the presence of Hezbollah, Lebanese Prime Minister Saad Hariri, at the request of Saudi Arabia, authorised his army to participate in the operation. This is the first time that the two armies – Lebanese and Syrian – and the Resistance, have officially acted together. Riyadh, without disarming in the face of the Party of God and Iran, decided that it made more sense to work with Hezbollah and finish in priority with the jihadists. Finally, this war, which was intended to destroy the states of the region, is now taking the opposite direction – the unity of the forces of Iran, Iraq, Syria and Lebanon. “From Camp Darby US weapons for the war in Syria and Yemen”, by Manlio Dinucci, Translation Anoosha Boralessa, Il Manifesto (Italy) , Voltaire Network, 18 April 2017. “The Pentagon is following through on arms agreements that Obama made with Jihadists”, Translation Anoosha Boralessa, Voltaire Network, 30 May 2017. Classified Woman. The Sibel Edmonds Story: A Memoir et The Lone Gladio, Sibel Edmonds. The Russian Defense Ministry said that the Russian Aerospace Forces killed more than 200 Saudi Zio-Wahhabi ISIS terrorists and destroyed a convoy consisting of scores of cars and armored vehicles which was heading to Deir Ezzor city. In a statement on Monday, the Ministry said that the Russian Aerospace Forces carried out intensive airstrikes against an ISIS convoy that was heading to Deir Ezzor city, killing more than 200 ISIS terrorists and destroying around 20 SUVs armed with large-caliber weapons and mortar launchers. The Russian jets have also taken out a number of armored vehicles, including tanks and heavy vehicles carrying ammunition, according to the statement. 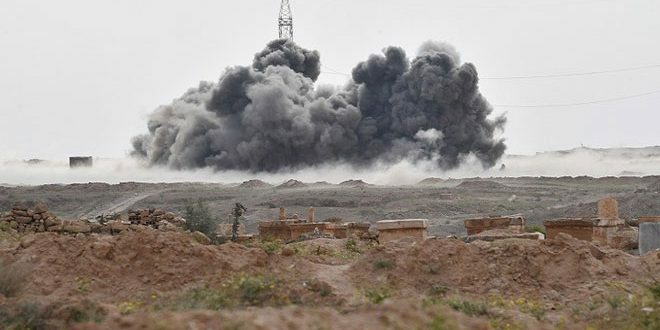 The Russian Aerospace Forces destroyed another large column of ISIS terrorists that was heading to the area of the city of Deir Ezzor, where terrorists are trying to regroup and set up their last base in Syria, the statement said. The Ministry noted that Saudi Zio-Wahhabi ISIS terrorists, having suffered heavy losses in Raqqa and Homs provinces due to the Syrian Arab Army operations supported by the Syrian and Russian air forces, are now trying to make their last stand in Deir Ezzor. The Russian Aerospace Forces started on September 30th, 2015 a military operation upon the request of the Syrian government to support the Syrian Arab Army in fighting terrorism. Damascus, SANA – President Bashar al-Assad affirmed that the future directions of the Syrian policy will be based on continuing the fight against terrorism and crushing the terrorists everywhere on Syrian soil and continuing national reconciliations that have proved their effectiveness, in addition to increasing communication with the outside and marketing economy which has entered the stage of recovery. 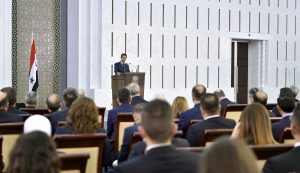 In a speech delivered at the opening of the Foreign and Expatriates Ministry Conference on Sunday, President al-Assad pointed out to the Ministry Conference’s importance due to the very rapid dynamics of the events in the world, the region, and Syria in particular. “Direct dialogue is important for creating unified visions and shaping stances,” he said. The President said throughout history, Syria has been a target, and those who control this target gain great control over decision-making in the Middle East, and those who control decision-making in the Middle East will have important and influential say on the international arena and in the international decision, or rather in the international balance. He went on saying that it is very superficial to say that the cause of this war is Syria’s positions and that the West wants to “discipline” the Syrian state. “This talk true and not wrong at all. It is a fact, but it is only a part of the bigger picture. This picture is related to the international conflict and the attempt to change the international balances or consolidate them in the military sense and in the political sense and to the ensued economic and geographical outcomes. Geographical in terms of new states emerging, existing states disappearing, or changing frontiers,” the President added. He elaborated that this conflict is a valuable opportunity for the West to “settle the account” with so many countries and subjugating countries which have refused to bow to the West’s hegemony during the past years or decades, including Syria, Iran, the Democratic People’s Republic of Korea, Belarus among others, even Russia. 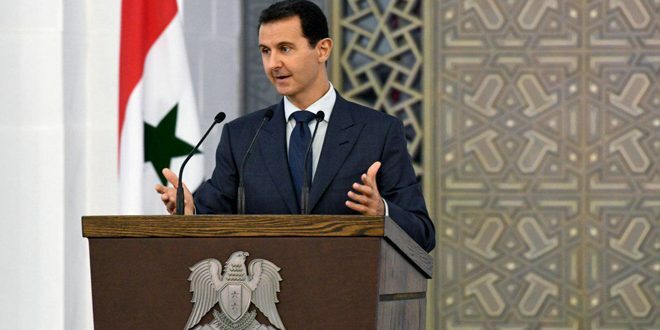 “Today the West is facing an existential conflict….living in a state of hysteria whenever there is a state that wants to take part with it in the international decision-making in any field and in any place in the world,” said President al-Assad said. The President stressed that all in all, there are two powers in this conflict; one that works in favor of the ruling elites, even if that would lead to violating all the international laws, conventions and the UN Charter and the deaths of millions of people in any place in the world, while the other power, in turn, works for maintaining the sovereignty of the countries, the international law and the UN Charter and sees in that an interest for it and for the stability of the world, noting that the Arab weight in this conflict is “zero”. In any such kind of conflicts, he added, those who pay the price are the smaller countries. “We paid a dear price in Syria in this war, but we have managed to foil the Western project in Syria and the world,” he said, noting that this project is aimed at helping the Muslim Brotherhood to rule the region, so that they can control a society and a street using the cover of religion and lead it towards achieving the Western interests. “Talking about foiling the Western project in the region doesn’t mean we are victorious…they have failed, but the battle is still going on. They have failed until this moment, and we haven’t won until this moment. The signs of victory are there, but signs are something and victory itself is another thing,” President al-Assad said. “I want that we understand that we are living in an inseparable phase, linked to the stages that preceded it for several decades,” said the President, adding that while it is true that Syria has lost its youth and infrastructure, but it has won a healthier and more homogeneous society in the real sense. “Therefore, the current reality and the cohesion of society as we see it today is a fact,” he stressed. President noted that that changes that happened recently in the Western positions don’t mean changes in policies, adding that “the West is like a snake, changing its skin according to the situation. He made it clear that these changes have been prompted by the steadfastness of the people, the state, the armed forces, and of course because of the support of friends, and not because the human conscience of the West has suddenly woken up. The President highlighted that after the West failed in their attempts with igniting and supporting a “popular movement” and later with openly supporting the militants and giving them the cover of the “opposition”, they moved to “the other product, the human product. And we are now in this phase”. He said that this product can be summed up in the West showing “complete silence” whenever the terrorists advance in any area, whereas when the Syrian army advances, they start wailing and begging for a truce using the pretext of humanitarian assistance, stressing that the real goal of the West’s calls for truces is to give the militants the opportunity to get reorganized and re-armed and to send more terrorists to support them and later carry on with the terrorist acts. He noted that Syria participated in Astana based on a clear national vision and with great confidence in the friends in Iran and in Russia. “Erdogan is playing the role of political beggar after his support for terrorists was exposed. We don’t consider the Turkish side to be a partner nor a guarantor nor do we trust it,” he said. 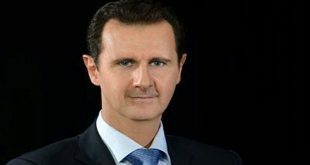 President al-Assad affirmed that as long as the fight against terrorism is ongoing, there is no place for the idea of a fait accompli or division in Syria, adding that the goal of de-escalation zones is to stop bloodshed, deliver humanitarian aid, removing militants, and restoring the situation to normal. The President affirmed that “Our Armed Forces are realizing one achievement after another every day, one week after the other, crushing terrorists and clearing the lands desecrated by terrorists,” adding that the valiant heroics of the Syrian Arab Army and supporting forces constitute a role model in the history of wars. 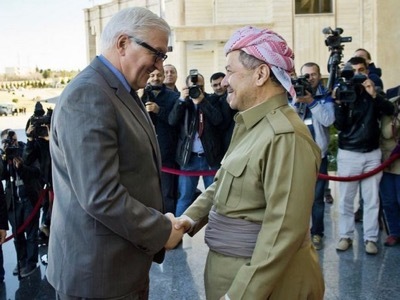 “We will continue in the upcoming stage to crush terrorists everywhere in cooperation with friends, and we will continue national reconciliations that proved their effectiveness, as well as increasing communication with the outside and marketing economic opportunities… The direct political, economic, and military support of our friends made the possibility of advancing on the ground greater and the losses fewer, and these friends are our actual partners,” President al-Assad asserted. “We will not allow enemies and rivals to achieve through politics what they failed to achieve through terrorism. We must work seriously from now to build the future Syria on solid bases,” the President said. “Everything related to the destiny and future of Syria is a one hundred percent Syrian issue, and the unity of Syrian territory is self-evident and not up for debate or discussion,” he affirmed. Later, a session was held during which discussions focused on means of developing diplomatic work and performance through putting clear mechanisms for administrative development, nomination criteria, adopting plans to qualify cadres, and the importance of clarifying and institutionalizing the relationship between embassies and consulates abroad on the one hand, and state ministries on the other, as the work of Foreign Ministry is not limited to the political side, but it goes to several aspects, including the economic and cultural aspects. 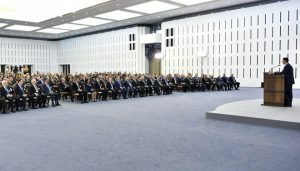 President al-Assad pointed to the need for reconsidering the map of Syria’s relations with countries of the world, affirming that the strategic future approach of Syria must be towards the East and here lies the importance of the role of diplomats through their permanent knowledge of the priorities of the Syrian needs and knowledge of the places of power of the countries where they work in a way to meet the aspired-for benefit in the economic, scientific and cultural sectors. The Syrian president, Bashar al-Assad, has admitted to a shortage of soldiers and military setbacks, in his first public speech for a year. Assad also hailed “positive” changes in western attitudes to the conflict in the country – suggesting the US and its allies now understood they share an interest with his regime in defeating Isis-style jihadi terrorism. But he gave no overt indication that he was ready to cut a deal to end the four-year civil war that has left his regime in control of just a third or less of the country. The priority US and Britain are giving to defeating Islamic State extremists, who hold large areas of north-east Syria and northern and western Iraq, has prompted suggestions Barack Obama’s administration may drop its insistence that Assad stand down as part of any deal. Assad’s regime lost control of the north-western province of Idlib in March and has suffered losses in the south near the border with Jordan. The regime’s control is now limited to the big population centres of western Syria, including Damascus, Homs, Hama and the Mediterranean coastal region that forms the heartland of Assad’s Alawite sect. Assad’s ally, the Iran-backed Lebanese militia Hezbollah, has been more successful in pushing back Isis and al-Nusra Front fighters from the Syrian-Lebanese border. He publicly acknowledged Hezbollah’s “important” and “effective” assistance for the first time. He insisted that any political settlement must be based on eliminating terrorism – referring to both the western-backed rebel forces and jihadis such as Isis. Despite their more positive approach, he complained western countries still regarded regime opponents as revolutionaries rather than terrorists. 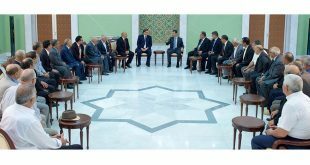 “As long as terrorism is part of the external opposition that participates in the dialogue … talk of a political solution will be nothing but empty words,” Assad said. A Syrian woman with the words “hands off” painted on her face takes part in a protest against US military action in Syria across the road from the entrance of Downing Street in London, Aug. 28, 2013. The philosopher and politician Antoun Saadeh was a true visionary. He died in 1949; but before he perished, he foretold of the sorts of conflicts and wars that we are seeing today in Syria and the Middle East. He is perhaps best known for founding the Syrian Social Nationalist Party (SSNP) in 1932, which would result in his arrest three years later. His 1935 arrest was the first of several that would see him locked up in intermittent periods between that year and 1937. But his imprisonment did not stop him from expanding on the ideology he established with the SSNP, as he would write three books (“The Rise of Nations,” “Principles Explained” and “The Rise of the Syrian Nation”) while in prison. His manuscript for the third book was taken by French authorities and now sits under lock and key in the Louvre, much like Saadeh himself when he was jailed. But in the years since his death, his birthplace of Lebanon has become a highly sectarian nation and society. In the political scene, the nation is broken into pieces by religion and sect. The President must be Maronite Catholic, while the Prime Minister must be Sunni Muslim and the Speaker of the Parliament must be Druze. Religion and sect are not chosen through one’s own free will, but are imposed at birth. Foreign powers, hoping to create chaos in the Middle East, have long used the tactic of igniting sectarian strife in the countries they wish to target, pitting some of the population against others through the strategy of “divide and conquer.” The U.S. and NATO have used this extensively in Iraq, Syria and Lebanon. The SSNP’s official logo, the “Zawba’a,” is a symbol derived from Mesopotamian art. The red whirlwind symbol is said to symbolize the blood that was shed by the party’s martyrs throughout its history, while the black circle symbolizes the dark ages of sectarianism and colonial oppression. 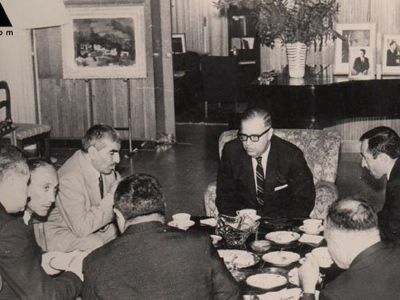 In keeping with his ideology, Saadeh opposed the colonization that broke up greater Syria. His ideology refers to a “Natural Syria,” including the Fertile Crescent, that comprises a Syrian homeland that includes the Taurus and Zagros mountains, extending to the Suez Canal and the Red Sea, across the Sinai and Gulf of Aqaba and down to the Mediterranean Sea, including the island of Cyprus, down to the Arabian Desert and Persian Gulf. Saadeh traced Syrian history back to the ancient Phoenicians, Canaanites, Assyrians and Babylonians, believing that the people of Syria transcended religious distinctions. To him geography was the defining characteristic of the nation – not religion or ethnicity. He felt that Syria was historically, culturally and geographically distinct from the rest of the Arab world. Saadeh witnessed the end of World War I in 1918, which saw the violent partitioning of Syria into smaller states, with part of Syrian territory given to the new Turkish government. Lebanon was cut out of Syria and declared an independent state in 1920. Syria then endured a brutal and repressive military occupation by France from 1920 to 1946. “According to the Chairman of the U.S. Joint Chiefs of Staff General Joseph Dunford, the partition of Syria is in their plans. Saadeh saw the land grab Turkey made in northwest Syria in 1920. Now, in 2017, we are witnessing history repeating itself, much of which was foreseen by Saadeh. Conflicts in Iraq, Syria and Turkey have created a tangle of political and military organizations among the Kurds. The estimated 25 to 35 million ethnic Kurds spread across Turkey, Iraq, Syria and Iran are at the center of several conflicts that are now reshaping the Middle East. For instance, The Kurdistan Workers’ Party (PKK) has carried out a nearly four-decade long armed struggle against the Turkish state, resulting in the deaths of about 40,000 people. In Syria, the Kurds are full Syrian citizens, having all the same rights as other Syrians under secular civil law. Syria is made up of many religious and ethnic groups, and all are full citizens, including the country’s small Jewish community. However, some Syrian Kurds have seen the chaos brought on by external threats to Syria as an opportunity to benefit from their neighbors’ suffering. Not only have they benefited financially by fighting as salaried soldiers under the U.S. government, but they are drawing the long-term benefit of declaring their own homeland from land they have stolen from other Syrians. Kurds currently fighting for the U.S. are committing a large-scale ethnic cleansing of non-Kurdish civilians. During Saddeh’s lifetime, he saw European Jewish immigrants coming into Palestine with a Zionist plan to eventually declare it a Jewish state. The Jewish state of Israel was declared in 1948, not long before Saadeh was executed. Palestinian refugees flee violence following the creation of the Israeli state on their homeland in 1948. Saadeh warned of the rise of Israel. He said the dangers of the Zionists were not only in Palestine, but in Lebanon, Syria and Iraq. In 1938, Saadeh said the Zionists would not stop at Palestine, but would, in fact, want to expand beyond the region’s borders. 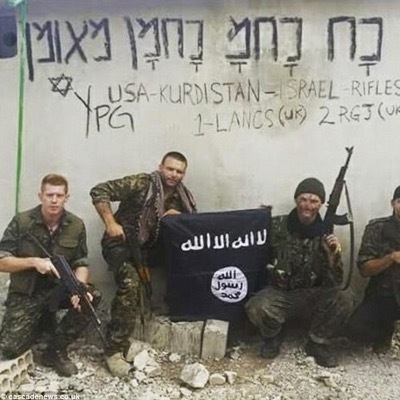 In the current Syrian conflict, Israel has been supporting radical Islamic terrorists who are fighting for regime change. This suits Israeli policy in Syria, and Israel has therefore gone so far as to treat wounded terrorists inside Israeli hospitals. With the Ottoman defeat in 1918, the Arabs saw their lands divided into French and British areas in accordance with the Sykes-Picot accords of 1916. Lebanon became a French mandate and in September 1920, the frontiers of modern-day Lebanon were established. It was about that time that Saadeh completed his education and left Lebanon, first for the U.S., and a year later in 1921, for Brazil. Greedy superpowers have sought to carve up Syria since the days of the Ottoman Empire. From the French and English after World War I to the U.S., Israel and Arab Gulf states of today – all have supported the destruction of Syria. Saadeh, in his time, worked to oppose those superpowers that would seek to endanger the country. His efforts ended with his execution on July 8, 1949, as he was found to be a danger to the geopolitical goals of the countries he opposed. Saadeh grew up under the oppressive occupation of his home by a foreign power. His visionary ideology touched on issues that still make headlines today, even as he wrote about them almost 100 years ago. His warnings about potential threats to Syria and the Middle East still ring true. But kingdoms built on the shifting sands of the Middle East may one day blow away in the hot desert winds and take their Western masters along in the whirlwind.